Want to know the secret to getting your best Fix ever? Just like any good relationship, it’s all about being open, honest and very communicative. 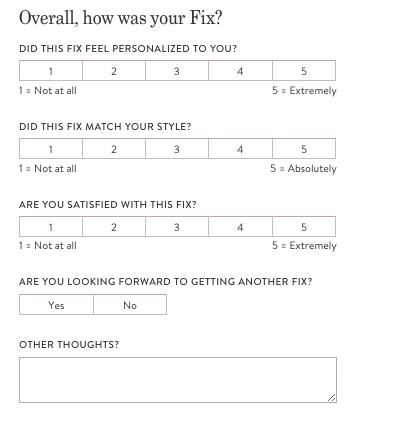 And here at Stitch Fix, your feedback is at the center of the relationship between you and your Stylist. 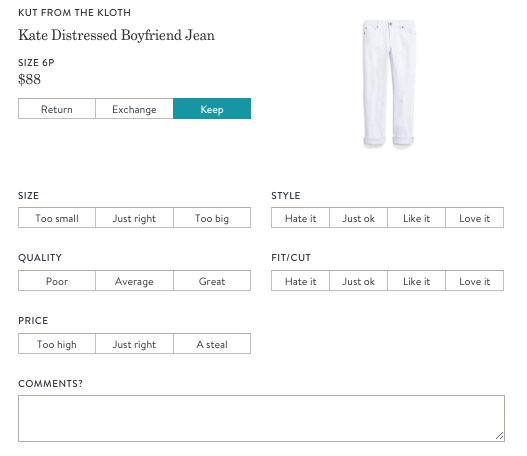 Your Stylist reads all of your feedback & notes, and hand-selects pieces for your Fix based on the notes you leave for her. Read on for our Stylist’s tips on leaving Fix feedback! 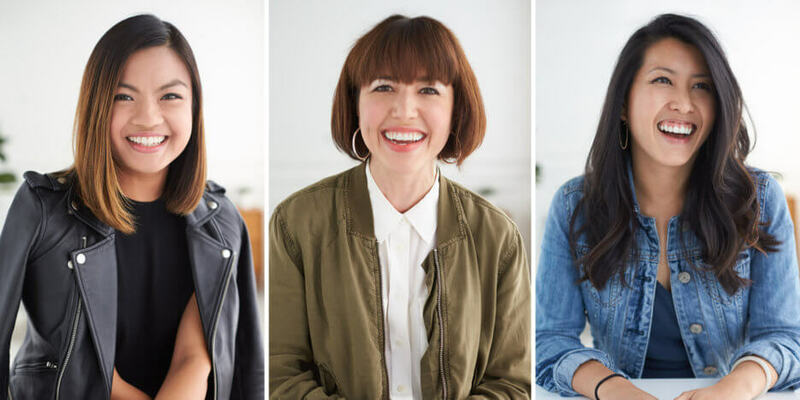 Meet Stylists Angela, Nicole and Julia! When you schedule a Fix, your Stylist carefully reads through your Profile Notes, your latest Fix notes, comments from previous shipments & checks out your Pinterest board to style you. But what happens after you get your Fix to make your next one even better? Your feedback of course! “I read every piece of feedback my clients leave,” says Angela. “Your feedback, whether it’s when you check out or in your Fix Note is really helpful information for your Stylist to get it right next time,” assures Julia. So next time you’re checking out your Fix (after you’ve decided what to keep), here’s what to do. 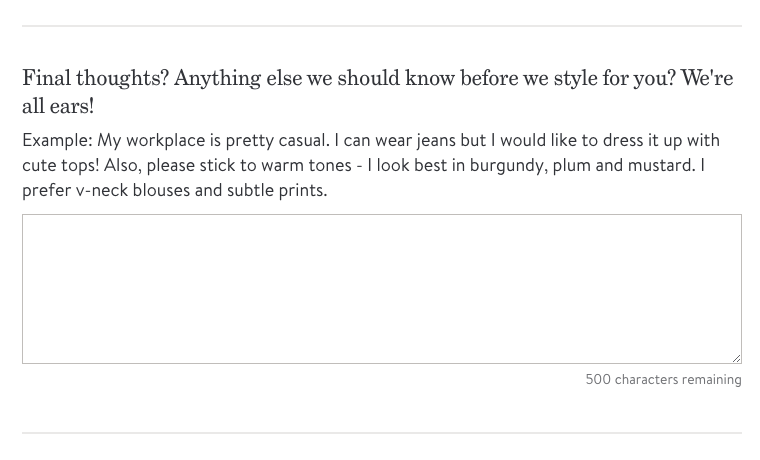 There are three distinct places for you to leave feedback and notes for your Stylist. Here are tips & tricks for each style of feedback, what the feedback looks like & how often you should update your information. Anything else you want your Stylist to know! 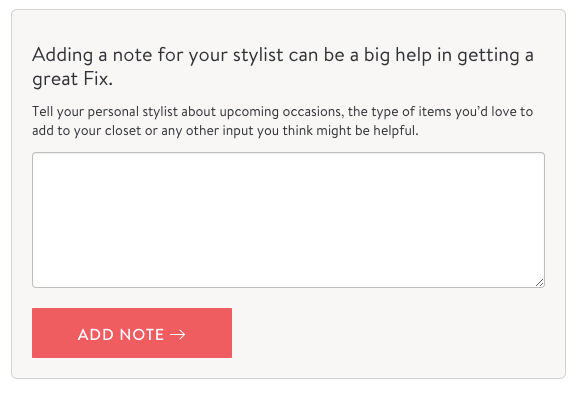 Be sure to update your Style Profile frequently to keep your Stylist up-to-date & in-the-know. The best time to do this is right after your Fix, when your style notes are fresh in your mind. Anything else you think your Stylist should know! You should update your Fix Notes every time you schedule a Fix! When you checkout, this is the most important time to tell us what you did and didn’t love about your Fix. “If we could have one superpower, it would be mind reading!” says Nicole. “But until then, be specific about why you didn’t love the pieces in your Fix. Tell us if it’s the color, style or fabric they didn’t like,” says Angela. When leaving feedback, “tell us what you didn’t love it and try to be as constructive as possible. Give us as many details as possible so we know what to look for next time,” adds Julia. Fill out all of the selections for each item you receive! Those jeans too pricey? Let us know! The more we know about your preferences, the better we get to know you! Comment on color! If you’re just not a fan of the color or print of a certain item, tell us in the comments. In your overall Fix feedback, tell us how you liked this Fix. Did you feel like it just wasn’t you? Get specific and tell us how—was it the colors that were included or was the fit not the greatest. Give us the scoop! You should leave comments after every Fix. Your Stylist will read through your shipment history to get a better idea of what you need in terms of fit, style & budget. Ready to flex your feedback muscles?